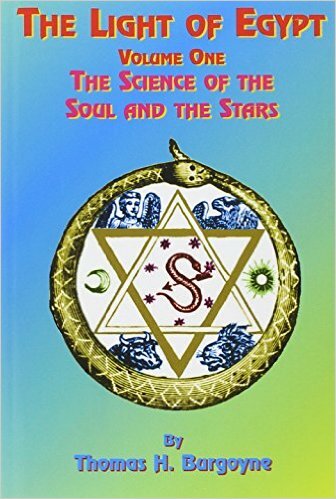 The Bible is a manual about physiological regeneration and astrology, written in code (SEE Gematria), providing us a path to enlightenment (atonement). 99% of the people believe the Bible is a historical book to be taken literally. It’s not, it’s about you and YOUR path to enlightenment. You are the Protagonist. No one’s coming to save you. All of these parables were written about and for you. The “Temple of God” is your body, not a building. Of course, if you believe we evolved from biological sludge 3 billion years ago, this doesn’t make any sense. Now, we’re never taught this information because the powers that be don’t want you to understand what you are. They like you confused, distracted and deceived which is why “you give them bread and circuses and they will never revolt (Juvenal).” For the past 500 years, it was the church’s role to mislead the masses. Now the “scientism” and “new age” community has gleefully taken over that role. I digress, but, regardless of what you believe to be undeniably true, this is pretty interesting to think about, and the ultimate gift if you can assimilate. “Seed, word” and “God,” are all synonyms of one and the same thing the wonderful creative substance, the universal esse, from which all things are brought forth, and in which all things are. The Scriptures, or allegories and parables of the Bible, are the only writings that give us information as to what the Word of God is. Therefore, in this book, we will quote what is written there in regard to it. 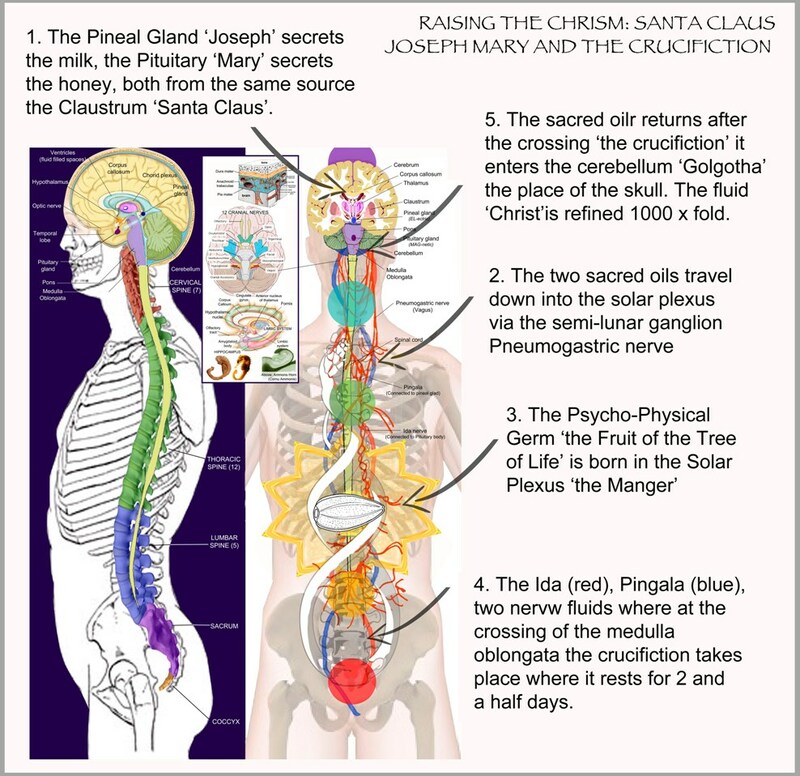 The fluid, oil, or marrow which flows down the spinal cord, comes from the upper brain, the Creator or Father, the “Most High,” and is known in physiology as ovum, or generative seed that life essence which creates the human form of corruptible flesh. In the Greek, from which the New Testament was translated, this marrow is called Christ, which is the Greek word for oil. 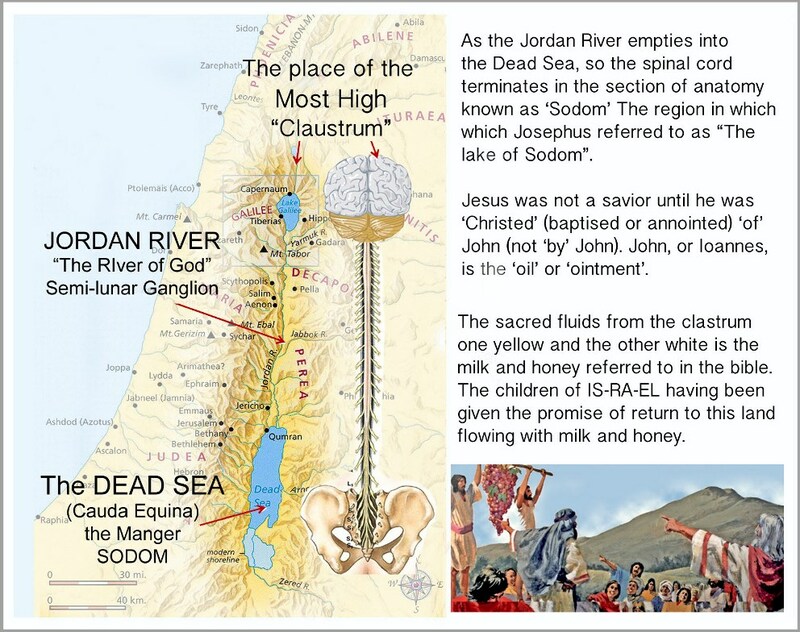 These adepts knew that the secretion (gray matter creative) which issues (secretes), from the cerebrum, was the source and cause of the physical expression called man; and they knew that the “River of Jordan” was symbolized in the spinal cord and that the “Dead Sea” was used to symbolize the Sacred Plexus at the base of the spinal column where the Jordan (spinal cord) ends, typifying the entrance of Jordan into the Dead Sea. The thick, oily and salty substance composing the Sacral Plexus, “Cauda Equina” (tail of the horse), may be likened unto crude Petroleum (Petra, mineral, or salt, and oleum Latin for oil) and the thinner substance, oil or ointment in the spinal cord, may be compared with coal oil ; and when this oil is carried up and crosses the Ida and Pingala (two fluid nerves that end in a cross in medulla oblongata where it contacts the cerebellum (Golgotha the place of the skull) this fluid is refined, as coal oil is refined, to produce gasoline a higher rate of motion that causes the ascension of the airship. When the oil (ointment) is crucified (to crucify means to increase in power a thousand fold not to kill) it remains two days and a half, (the moon’s period in a sign) in the tomb (cerebellum) and on the third day ascends to the Pineal Gland that connects the cerebellum with the Optic Thalmus, the Central Eye in the Throne of God that is the chamber overtopped by the hollow (hallowed) caused by the curve of the cerebrum (the “Most High” of the body) which is the “Temple of the Living God” the living, vital substance which is a precipitation of the “Breath of Life” breathed into man therefore, the “Holy (whole) Ghost” or breath. The Pineal Gland is the “Pinnacle of the Temple.” The modus operandi by which the oil of the spinal cord reaches the Pineal Gland is described in what follows. “There is no name under Heaven whereby ye may be saved except Jesus Christed and then crucified” (correct rendering of the Greek text). “ON EITHER side of the Thalamus, in the head, is a gland, known in physiology as the Pineal, on the posterior, and the Pituitary on the anterior side of the Thalamus. The Pineal is cone shaped, and secretes a yellow or golden fluid. The Pituitary Body, opposite it, is ellipsoid in shape, and contains a whitish secretion, like milk. The fluids that are found in both these bodies come from the same source, namely, the Claustrum, which means “barrier” or “cloister,” and is referred to as cloister for the very good reason that a precious and holy thing is secreted or secluded there. Saint Claus, or Santa Claus, is another term for this precious fluid, which is indeed a holy gift in the body of each one of us. The precious fluid which flows down from the Claustrum separates, part going into the Pineal gland and part to the Pituitary body, and these, being special laboratories of the head, differentiate the fluid from the Claustrum, and it takes on the colors above mentioned, and in the Pineal Gland becomes yellow and has electric properties. The Pituitary Body, having the milk-like fluid, has magnetic properties. These two glands are the male and female, the Joseph and Mary of the physical body, and are the par-ents of the spiritual son born in the solar plexus of each human being, commencing about the age of twelve. This yellow and white material, which is the milk and honey referred to in the Bible, the children of Israel having been given the promise of a return to this land flowing with milk and honey, at last reaches the solar plexus via semi-lunar ganglia (see chart), the Bethlehem of the physical body. In Hebrew, Bethlehem means “house” (Beth) of bread (lehem). “I am the bread of life,” said the allegorical Jesus. To read the full text – God-Man: The Word Made Flesh click here.